the Nolan/Shinkaruk is the silver version, /90, and the Roy/Price/Fucale is the gold version, /12. Comments welcome, thanks for looking..... Mark. That triple with Roy is really nice! Nice hits! Nice break! We might have to tee up another trade for that Mueller and the Nolan/Shinkaruk haha. The triple is vey nice! I'd be interested in the Bure if available. Awesome hit with the triple, I'm a bit jealous!!!! Nice hit too with the Monahan, Calgary first pick (6th overall). Mueller is the San Jose Sharks first pick (18th overall). 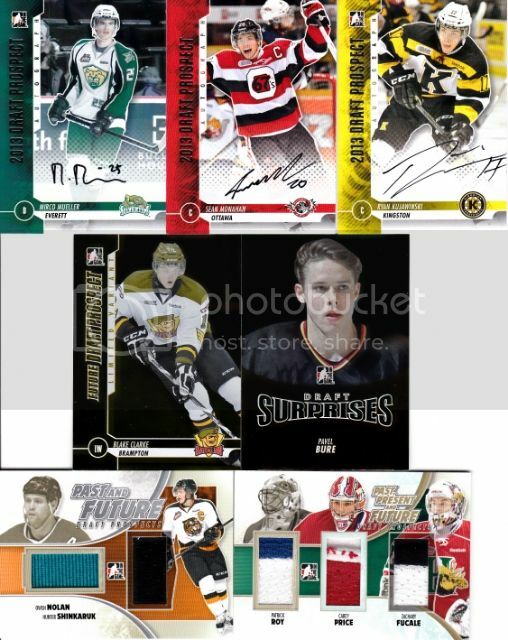 Nice cards especially the triple goalie card!